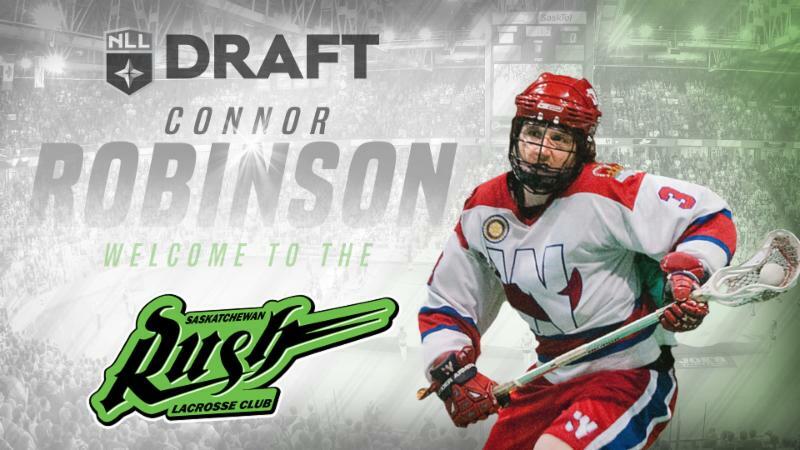 Philadelphia, PA - The Saskatchewan Rush bolstered their offensive talent pool of the future by selecting Connor Robinson with the fifth overall pick in the National Lacrosse League Entry Draft held Tuesday night in Philadelphia. A 6-foot, 210-pound lefty forward was a sensational junior player in the lineup for his hometown New Westminster (B.C.) Salmonbellies. His final year of junior saw him reach the 100-point plateau with an astonishing 130 points, including a record 80 assists. “I’m happy to be a Rush,” said Robinson. “It does add some pressure coming to a team that has won three of the last four championships, but it’s a great spot to come to and I am looking to help and improve as much as I can. Noted for a combination of strength and talent with a willingness to get to the dirty areas on the turf, Robinson is the complete package. Robinson played field lacrosse with High Point University and wrapped his tenure in the NCAA by earning Second Team all-conference honors and setting a school record with hat tricks in six consecutive games. After trading two other first-round picks to re-acquire defenceman Brett Mydske, who was selected in the Expansion Draft by the San Diego Seals, and their second-round pick, the Rush were back on the clock in the Third Round. With the 37th overall selection, the Rush reached across the Prairies to pick hulking Calgary Mountaineers defenceman and team captain Ryan McLean. The 6-foot-4, 225-pound McLean, who hails from Okotoks, Alberta, played five years of junior with the Moutaineers totaling 30 points and 225 penalty minutes. He went into the draft as an unranked prospect but did enough to earn the selection at the NLL’s recent combine in Vancouver. With their fourth-round spot traded to San Diego in the Mydske deal, the Rush had to wait until the fifth round for their next pick, and then used it to grab Dalton Lupul from the New Westminster Salmonbellies. The left-shooting transition finished his fourth season at the Junior ‘A’ level playing for his hometown team with 25 points in 21 regular-season games. Saskatchewan had two picks in the sixth and final round. With the 67th overall pick, the Rush opted for left-shooting defenceman Tyler Gaulton from Limestone College – the same school that produced Rush defencemen Brett Mydske and Mike Messenger. Gaulton helped Limestone win NCAA Div. II titles in 2015 and 2017, and the Enniskillen, Ontario, product earned Div. II All-American honors in each of his four years, including First Team in 2016 and Honorable Mention as a senior in 2018. Gaulton played five years at the Junior ‘A’ level with the Peterborough Lakers. With the final pick of the draft at No. 74, the Rush went for some hometown flavor of their own as they selected Saskatchewan Swat forward Zach Gould. He led the Swat with 24 points and finished fourth in the RMLL with an average of 4.0 points per game.